Castle Greyhawk: Worth the Effort? Welcome back Greyhawk fans! 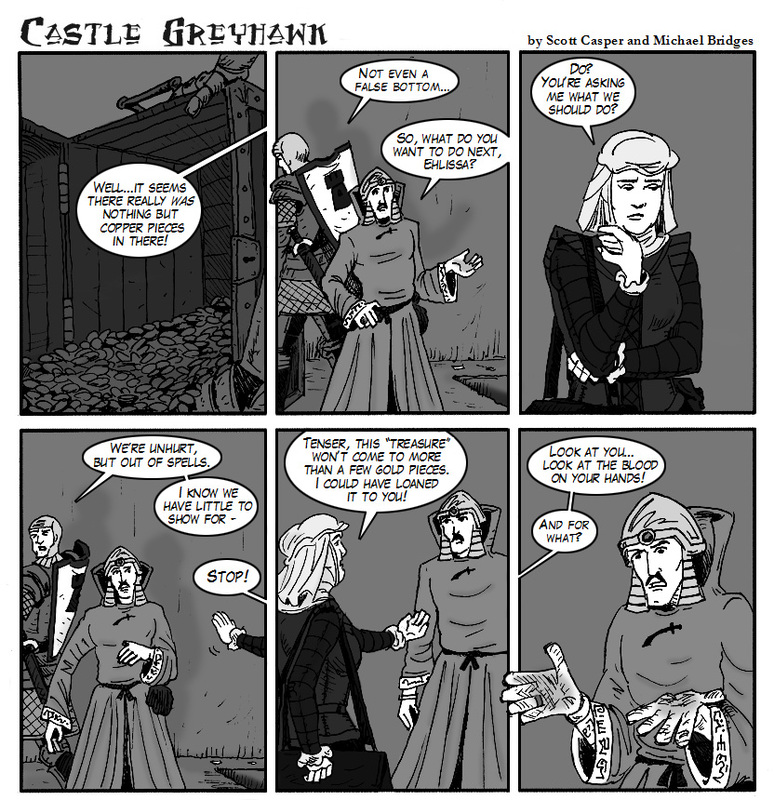 Once again it's time to check on the progress of our adventuring trio in page thirty-three of the epic Castle Greyhawk graphic novel. Follow the link to read extra important exposition by multi-talented author Scott Casper. You can also view the latest episode here, courtesy of Maldin's Greyhawk. Artist's Commentary: The first chapter is winding down fast and our "heroes" aren't wasting a moment to sift through their chest. Many times, especially in low level dungeon crawls, treasure scales up as PCs increase in level. So a minor haul could be useful to a 1st level character but then at 10th level, it's chump change to be given to the nearest poor village. When the loot doesn't add up there is always other sources of dungeon income. For example, I've seen players keep empty chests for their g.p. value. That's D&D for ya. It's been a while since I showcased the writing of Mystic Scholar, and that's because his work can now be found at Maldin's Greyhawk (also home to my Greyhawk Webcomic and the current Castle Greyhawk graphic novel). His little corner of the fansite is called Anamnesis of the Mystic Scholar. So far it contains only his World of Greyhawk fiction but he also plans to also post Pathfinder fiction soon. Check it out, bookmark it, and keep an eye out for more from the Mystic. "Three separate works, each showing the entire area of the Flanaess. 1. The Master Adventure Map lists the majority of the adventures given in the atlas as a whole. 2. The Player Map is an expansion of the original World of Greyhawk poster maps. 3. The Political Map lists the heraldry for states, cities, settlements, organizations and individuals of note in their appropriate geographical locations." Well done Braggi, your contributions to the Greyhawk community is deserving of legend. I look forward to whatever Greyhawk projects you pursue in the future. Check out and download Part 12 HERE. Follow this link to all the previous downloads in the series. Welcome back Greyhawk fans! 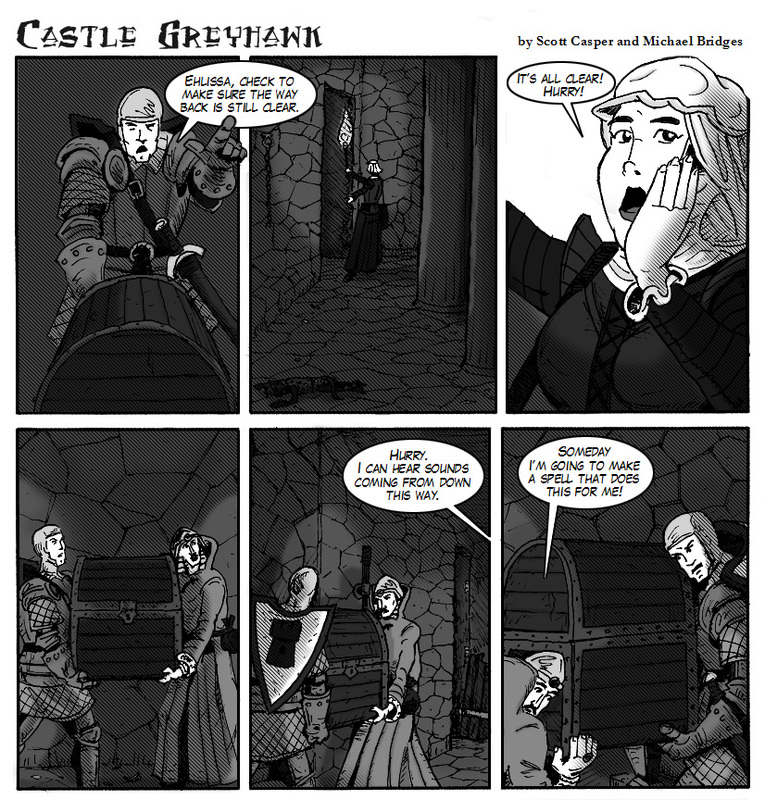 It's been a couple weeks so that means it's time for me to plug the most recent, page thirty-two of our epic Castle Greyhawk graphic novel. The link will take you to special story content and feedback by the community driven author Scott Casper. 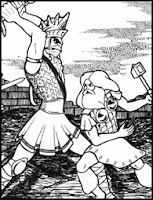 You can also view the latest episode here, courtesy of Maldin's Greyhawk. Artist's Commentary: This page gave me fits for some reason. I serious redrew half the panels, which I hardly ever do. Carrying objects can be done in a number of ways and getting a proper weighty feel to the picture can be tricky. I could probably try a third time and still not be happy. The other fun thing is how we're back tracking through rooms from previous pages. Only a discerning reader (or writer) would notice these minor details (like manacles hanging from the wall) but continuity is important sometimes. The punchline of this page has already garnered some chatter as we hoped it would. As always when it comes to Greyhawk, it's been fun developing the small things that lead to iconic parts of the setting. That's why this page is going to be memorable. The Cult of the Devourer by Andrew Hamilton details the machinations, magic and monsters for the cult of Juiblex, demon-lord of slimes and oozes. What's not to like there? The Mired Cathedral by C. Wesley Clough is a short 4th-6th level site-based adventure (bring a cleric). I know well Wesley's previous work from Canonfire so I'm glad to see him still writing for Dragonsfoot. Looking for a good weapon for your paladin character? The Holy Sword by Atiq Shafi is just what you need to read then! This article has several unique swords that should liven up a game. If you're like me, fond of offbeat modules such as Dungeonland or Land Beyond the Magic Mirror, then the article Creatures of Tulgey Wood by Stuart Marshall should catch your eye. Stuart stats out some recognizable and rare critters based on Lewis Carroll's classic novels. Stuart also provides my favorite article of the issue, An Unhealthy Obsession with Equipment. This is what it sounds like, nine awesome pages of both mundane and rare equipment with g.p. cost and weight (in AD&D coin weight). I'm looking forward to using these exhaustive lists to trick my players into spending their loot. There is much more in issue 18 of Footprints. Check it out. "Life flies by and when it does, Greyhawk waits for you." Follow the links to read the most current or previous episodes. Also at the Canonfire Crier, check out Argon's post about lesser known holidays of Growfest. At Wizards people have been buzzing about cartoonist, Jason Thompson's wildly detailed and humorous "walk-thru" maps of classic modules. So far he has done White Plume Mountain and the Tomb of Horrors. A walk-thru of Expedition to the Barrier Peaks is coming soon. Check these out. Speaking of the Tomb, Greyhawk Grognard reviews the old D&D novel Tomb of Horrors by Keith Francis Strohm. That is a book I've yet to read, check out the post for more info. Dennis Higgins' Hyborean Greyhawk blog has done it again. His campaign notes for combining Howardian worlds with Greyhawk interests me to no end. Now he has turned the world on end (or sideways) in a way I've never seen before. Have a look see.